Jimmy Jangles presents: The Optimus Prime Experiment: What would Optimus Prime do? 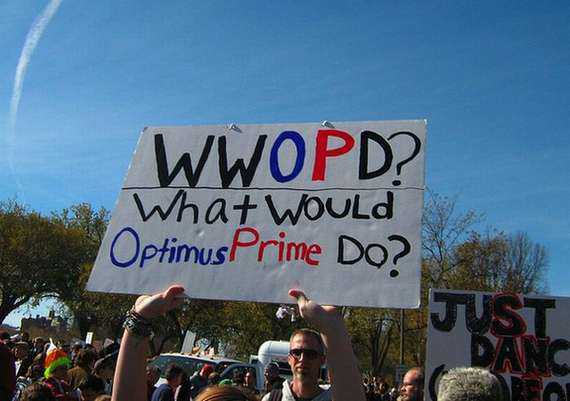 What would Optimus Prime do? If you’re ever having a few issues in life and need to think about how to respond to someone or what decision should be made, it’s time to forget about ‘What would Jesus do?’ and more correctly ask yourself, what would Optimus Prime do? And if the answer was shoot your enemy in the face, you’d probably be right, as long as you were of course protecting the freedom of all sentient life. If I'm wrong about this, the obvious answer is probably that Optimus Prime would change into a truck. Thanks to the Manatee for finding this.